Penn's Landing is located in Center City alongside the Delaware River. 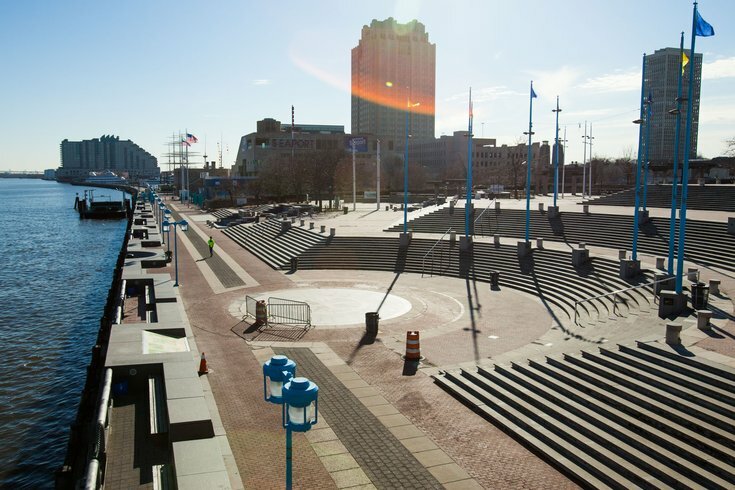 The Delaware River Waterfront Corporation has begun work on the installation of an ADA-compliant ramp to replace the staircase that leads from Market Street down to the waterfront at Penn's Landing. Demolition of the stairs will take place over the coming weeks with alternate pedestrian routes provided for waterfront visitors. Despite the busy season, DRWC officials chose August to initiate the work because summer temperatures favor the ramp's cast-in-place concrete materials. Construction will not impact SEPTA bus routes that serve the waterfront. The loop between Chestnut and Market streets will also remain open to motorists and pedestrians. To ensure safety, pedestrians are advised not to walk on the Scissor Ramps, which are intended for motorists only. The new ramp forms part of the DRWC's Master Plan for the Central Delaware, a long-term project seeking to transform the waterfront into an extension of the city and its neighborhoods to the west. "The current stairs are unusable for those in wheelchairs and are very difficult for people with other mobility issues or who have strollers to use," officials said in a release. 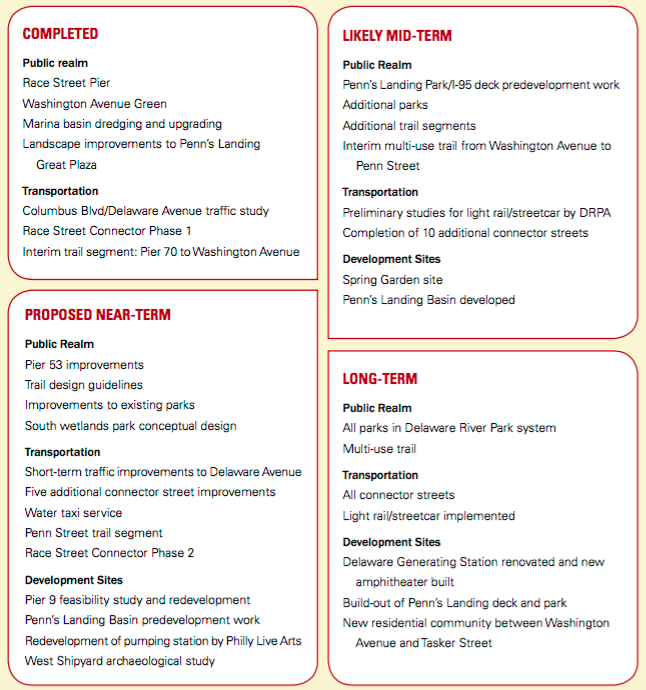 In total, the Master Plan covers the waterfront area from I-95 to the river and from Allegheny Avenue in the north to Oregon Avenue in the south. Approximately 6 linear miles of waterfront and 1,110 acres of property — 90 percent of it privately owned — are slated for redevelopment or renovation. Overview of projects in 30-year, $770 million Master Plan for the Central Delaware. Eventually, the project will encompass 96 acres of open space, 13 parks with diverse typologies and 4.8 miles of multi-use trails. Among the Master Plan's more prominent projects will be the overhaul of the current Festival Pier site, including the popular music venue. The mixed-use redevelopment, led by Jefferson Apartment Group and Haverford Properties, will feature 550 apartments, 30,000 square feet of retail and a public plaza to be designed by local architect and Civic Design Review Board member Cecil Baker. The ramp installation at Penn's Landing will be completed by the end of November in time for the Blue Cross RiverRink Winterfest.